King Kala Duke York, Jr.
Ming's Guard/Shark Man House Peters, Jr.
Ming's Guard Fred Kohler, Jr. The Flash Gordon serials were already 20 years old when I first saw them as a child on TV. Seeing them now with adult eyes, it's easy to laugh at their innocence, political incorrectness and many scientific flaws (not to mention their toylike props and primitive special effects). But even looking at them from the vantage point of the 21st century, with all the special effects expertise squandered on lackluster plots in today's films, FLASH GORDON is still exciting and fast paced. So much material is jammed into each 20 minute episode; so much plot is advanced with each line of dialogue, you can forgive the awkwardness of some of these lines because there's so much to feast your eyes on. I never read the Alex Raymond "cartoon strip" but certainly 1932 Olympic medalist Buster Crabbe was born to play the title role. His Flash is a man of action, willing to face any danger, and loyal to every friend, no matter how recent the friendship. Crabbe also is in superb physical shape and up to doing the many fights and stunts required. Although it's obvious a stunt double stood in for him occasionally, it's equally clear he did most of the athletic stunts himself, including the underwater sequences. Jean Rogers is likewise the perfect damsel in distress as Dale Arden, blonde and gorgeous and needing rescue at every turn. (Although Dale was dark haired in the Alex Raymond comic strip and in the 2nd and 3rd serials, rumor has it Rogers was made blonde in this because of the popularity of Jean Harlow.) Provoking lust in alien men and jealousy in alien women, Dale is forever screaming and fainting and no role model for any of today's females since she takes no positive action at any time but only serves as a pawn. Although she is clearly a villain, Princess Aura is the female who repeatedly takes decisive action, frequently rescues Flash and moves the action along. When I first saw these serials, Frank Shannon didn't seem incongruous to play Doctor Zarkov, but with his thick Irish accent, he now strikes the adult me as an odd choice for a Russian scientist. It must have been the beard that made him look both sinister and intellectual, although looking at him now, he reminds me more of Jim Henson. As an adult I confess to being annoyed at Zarkov's great facility with science (or at least his amazing luck in discovering new "rays"); he is able to summon up a newly discovered ray for almost every contingency: one replaces the power source holding up Vultan's Sky City; one restores Flash's memory which had been lost due to "draughts of forgetfulness"; one makes Flash invisible in time to escape execution; and one communicates the great distance between Earth and Mongo. All this and he designed and built his own rocketship as well (although it can't land unless all power on Earth is turned off!). Among the trio of Zarkov, Flash and Dale is everything you need in an adventure film: brains, brawn, bravery and beauty. Charles Middleton, long a baddie in Westerns, makes an indelible impression as the bald headed, high collared Ming, every inch the villain par excellence; his occasional hamminess just part of Ming's overall appeal. It's a shame he disappears for so much of the running time, replaced by his lesser minions. All of the heroes and some of the villains show a lot of thigh in this serial in an apparent attempt to look futuristic. 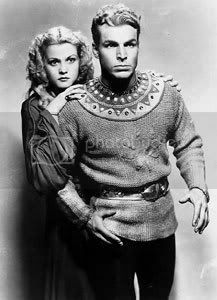 No costume designer is credited on screen (a lot of the costumes came from Universal's other period films), but I feel for Frank Shannon and Richard Alexander who had to parade around in pretty scanty outfits; they didn't have the athletic build of Buster Crabbe to bring it off. Crabbe, I understand, was embarrassed about having his hair dyed blonde, but this is how I first saw him and always think of him, so it's when he's dark haired that he looks odd to me. In his biography of Buster Crabbe, excerpted in FILMFAX No. 79, Karl Whitezel attributes this quote to Crabbe about his bleach job: "It was a little embarrassing. The bleach job didn't appeal to me at all." By the time of the first sequel, he was pleased to be reunited with the cast regulars in a followup to the earlier success and didn't mind the bleaching of his hair so much. Although no credit is given on screen for music, I have learned Universal recycled music from its other films (such as Franz Waxman's score for BRIDE OF FRANKENSTEIN (1935), WEREWOLF OF LONDON (1935), EAST OF JAVA (1935) and THE INVISIBLE MAN (1933) and other, presumably public domain, sources (Liszt's LES PRELUDES). There's no doubt music plays an important part in making FLASH GORDON a watchable and exciting event. Interestingly, Waxman's BRIDE music is heard to better effect in the FLASH GORDON serials than in BRIDE OF FRANKENSTEIN where it was used under dialogue sequences or drowned out by special effects noises. The militaristic passages, in particular, seem incongruous for BRIDE's villagers and perfectly appropriate for FLASH; the creepy themes for Dr. Pretorious and the Monster are heard only fleetingly in BRIDE but are used repeatedly in FLASH, fitting especially perfectly to the eerie Clay People sequences in FLASH GORDON GOES TO MARS. The "mad scientist" type music is from the Creation lab sequence of BRIDE OF FRANKENSTEIN. One of the things that gives me a lot of pleasure in these serials (and in older movies in general) is that the leading actors would be showcased at the beginning or end of the films, with a short silent clip from the film with their name and character's name superimposed. Very occasionally nowadays a film will still do this but, apparently, it is considered very old fashioned, so it is extremely rare, but something I wish EVERY film did. A word about the cliffhangers I always enjoyed: when I was a kid, there were still some Robert Lowery BATMAN serials circulating at kiddie matinees I attended, and it was always interesting to speculate on how the heroes would escape from certain death. Many serials did not play fair and when the action "wound back" at the beginning of each new episode to show the tail end of the previous chapter, occasionally something would occur to rescue the hero before the doom that awaited him, but the makers of FLASH GORDON, for the most part, played fair with its cliffhangers, although not all of them were equally nail-biting. As for its political correctness, Flash and Zarkov fly off to Mongo with good intentions but Flash seems overcome with protective ardor for Dale Arden which causes him to kill several Mongo citizens who are just obeying orders. While it's Princess Aura who causes the destruction of the Underwater Shark City, it is Zarkov who nearly destroys the floating Sky City. In addition, three animals sacred to Mongo are killed: the orangopoid and the tigron by Flash and the Fire Dragon by Zarkov. Most annoyingly to my adult sensibility, Dale is treated like chattel throughout the 3-hour running time, to be married off as a prize like the princesses in Grimm fairy tales. George Lucas tried to obtain the rights to remake FLASH GORDON and, because he was unsuccessful, the world instead received STAR WARS (1977) which went on to be amazingly successful, spawning several sequels (and prequels to come), and having a profound impact on merchandising and special effects for decades. It's easy to see FLASH GORDON's impact on the STAR WARS films in the use of the chapter headings, text summary of the story background as well as the overall swashbuckling flavor and larger than life villains and creatures. I can't help wishing for all the pleasure this serial has given me over the years, and the impact on people like George Lucas, that Universal had enough faith to expend the money to do it properly; there are a couple of sequences that are repeated from earlier chapters; and clearly the soundtrack has been augmented with voices after the fact, not using the original actors. An occasional chapter is dull and padded. Finally, director Frederick Stephani continually uses uninspired shots, framing things poorly or repeating the same camera setups. Despite all of this, FLASH GORDON was a success and went on to spawn two additional serials, the lamentable FLASH GORDON CONQUERS THE UNIVERSE (1940) which dared to replace Jean Rogers, Richard Alexander and Priscilla Lawson as Dale, Barin and Aura; and the truly great FLASH GORDON'S TRIP TO MARS (1938). In an interview published in FILMFAX #79, Crabbe revealed the entire first serial was shot in only six weeks for the entire 13 chapters. "We were on the set at seven each morning, broke for half an hour at lunchtime, then went back to work until five or six. We'd break for an hour to have dinner at the studio commissary or a nearby restaurant--depending on how we were costumed--and then reported back to the set for more shooting until ten at night or so, or whenever it was convenient to quit. We did this day in and day out, week in and week out, only taking Sundays off if we were on schedule." Crabbe also noted the cost-cutting use of standing Universal sets, including THE HUNCHBACK OF NOTRE DAME (1939) (the walls of which were the outer walls of Ming's castle) and Opera House interiors from THE PHANTOM OF THE OPERA (1925). Another example of thrift was the shooting of every possible scene that required actors in make-up of a particular kind within one day, so that every scene in the script that had Clay men, for example, was shot consecutively until all scenes featuring them were done. Earth is on the verge of destruction (stock footage of panicking crowds from around the world, possibly from SHOCK (1934) and LOOKING FOR TROUBLE (1935)) due to the Planet Mongo being on a collision course. Flash Gordon is on a transatlantic flight back to his father when atmospheric conditions force all the passengers to bail out. Even the sight of this "transatlantic flight" is amusingly naive; the seats aren't attached to the floor and there are no seat belts. Dale Arden happens to be on this flight and she and Flash share a parachute as they leap to safety, landing (in an amazingly fortuitous coincidence) right next to the rocketship of Doctor Zarkov, who they run into immediately (I told you this was fast paced). Zarkov explains his theory that Mongo is inhabited and radioactive. His assistant has turned coward and he asks Flash to help him fly to Mongo in his rocketship. Dale begs to go along and, because no place on Earth is safe, Zarkov agrees. The ship is just a wonderful design, very streamlined and toylike. Its interior is realistically cramped and there are no seats or straps of any kind. (The miniature and full sized rocketship from JUST IMAGINE (1930) was used). When Flash asks Zarkov about arriving safely at their destination, Zarkov casually mentions he's made tests with models but they've never returned! In his excitement at actually taking off, Zarkov forgets to turn on the oxygen, causing Dale nearly to faint. Using a "countermagnet" to brake their speed, the rocketship lands on Mongo, doing a belly flop amid a wonderful mountainous miniature with a great matte painting in the background of Ming's Palace atop the mountain. (Every time the rocketship takes off or lands, it seems to have to circle a couple of times, like a dog making itself comfortable before settling down.) Immediately, the ship is menaced by monsters, really lizards with extra spines stuck on them, made to look the size of dinosaurs against a miniature of the rocketship. Shortly thereafter, one of Ming's ships passes by and kills two of the monsters with "rays" shot from the needle nose of the ship (the ship itself is a similarly wonderful design with a sort of smiley face when viewed straight on). A man in tight fitting armor (Officer Torch) followed by two possible robots emerge from this ship and take Flash, Dale and Zarkov prisoner. When they confront Ming in his spacious throne room (which has a handy arena nearby), Zarkov learns Ming controls the movement of Mongo and plans to destroy Earth. Thinking quickly, Zarkov suggests Ming conquer it instead, and as a reward, Ming offers Zarkov the use of his laboratory. It is certainly one of the great plot flaws of the FLASH GORDON serials that Ming is so trusting and never even puts a guard on Zarkov, accepting at face value his offer for help against his own planet. When Ming leers at Dale and orders her taken away, Flash rushes to her defense, and engages in a sword fight with Ming's men. This catches the interest of Ming's daughter, Aura, who bargains to win Flash for her own if he survives a fight in the arena. This turns out to be a wrestling match against 3 fanged men. When Flash overcomes them, Aura rushes into the arena and the first cliffhanger brings chapter one to an end - Flash and Aura falling through a trap door into a pit which is clearly the lair of some kind of large creatures. Aura stashes Flash in one of Ming's rocketships; as soon as he's out of hearing, she vows he will never see Dale again. When Dale refuses to change her clothes into the latest Mongo attire or to marry Ming, he orders his high priest to subject her to the "dehumanizer" for as long as it takes to perform the marriage ceremony. Flash teaches himself how to fly Ming's rocketship and, noticing that Ming's Palace is being attacked by gyroships of the Lionmen, he takes off to battle them. The gyroships spin like tops and, even more than the rocketships, look like little toys. The Lionmen (of whom we see only one, Thun, their Prince, until Chapter 13), are long haired and bearded. Flash smashes into Thun's gyroship and both vessels crash; on the ground, they fight hand to hand and Flash spares Thun's life, forging an instant friendship between them. Thun then shows Flash a secret passage to the Palace, where they overcome the single guard minding the entrance and force him to take them to Zarkov in the lab. (This lab is the planetarium set from THE INVISIBLE RAY (1936). The lab machinery was created by Kenneth Strickfadden who also created the lab equipment for the Universal FRANKENSTEIN films.) Zarkov tells Flash he has repositioned Mongo so that it no longer will collide with Earth. Dale is hypnotized by a flashing light and dressed up like a harem girl in a tight fitting bra and flowing skirt, her midriff bare. Her hair, which previously had been pinned up, is now loose and flowing. The highpriest consults the oracle to see if the god Tao approves of the marriage (stock footage of dancing girls writhing before a large idol from JUST IMAGINE). Flash sees this also on the spaceograph (sort of a TV monitor-sized picturephone) in Zarkov's lab and learns about the impending marriage of Ming and Dale. He forces the guard to take him to the tunnel leading to the secret chamber where the marriage is taking place. Zarkov butters up Ming and manages to be invited as well. The marriage takes place before a completely different idol, also referred to as Tao, which is more lifesize and Egyptian in appearance, flanked by two small Sphinxes (the statue of Amon-Ra from THE MUMMY (1932)). The ceremony seems to consist of nothing more than a gong being sounded 13 times. On the 13th stroke, the ceremony will be completed. Flash hurries to Dale's rescue, slowed down first by a contingent of Ming's guards, and then by a creature unnamed here, but which turns up in Chapter 9 as the Fire Dragon (although it doesn't breathe fire during this appearance), which walks upright and has lobster-like claws. I had not read JABBERWOCKY when I first saw this as a child, but even now that's what I think of when I read that Lewis Carroll poem. Quoting from FILMFAX 79, Crabbe says: "There was a scene that featured Flash in combat with a Gocko: a fire-breathing dragon, eleven feet long, with a horse's head, the body of a dinosaur and the tail of a dragon. Operating the bulky monster was a horrendous job, since we were in an age without automation. One man did the whole job from inside by pushing the wire-framed structure about the set, turning its head and swishing its tail by hand cranks, and firing a flame-thrower through an opening in its mouth. It didn't look even remotely real, but it was the best thing we had at the time. Glenn Strange was the actor who dragged the Gocko around." This dragon is second cliffhanger, as Flash is caught up in its claw and loses consciousness. Thun overcomes the last of Ming's guards and with one of their ray guns, he shoots the dragon and rescues Flash. Flash strangles the musician before he can strike the 13th note on the gong, and when he and Thun push against the idol, it causes the idol's arm to move in a way the highpriest decides signifies Tao has been displeased. Flash and Thun push over the idol entirely, grab Dale and bolt. In Kala's underwater palace, Flash and Kala fight and when Flash overcomes him, Kala pretends he's going to let him and Dale go in the morning. However, he merely separates them and locks Flash in a tank which he then starts filling with water, and into which he releases a small octopus, which is the third cliffhanger. Dale is forced to watch Flash's underwater struggles and faints from the sight of them. Aura and Thun arrive and, using a ray gun, force Kala to drain the tank. Aura rescues Flash and tries to get him to leave with her, but Flash insists on going back for Dale. Spitefully, Aura destroys the controls which keep the water out of the underwater city and the sea starts to pour in. Once again, Dale passes out from lack of air. Kala tries to contact Ming on the spaceograph but the sea breaks through and swamps everyone, for this episode's cliffhanger. Using a ray to counteract the magnetic power that holds Kala's Shark Palace underwater, Ming raises the underwater city to the surface. Prince Barin appears to Zarkov, claiming to be the true ruler of Mongo, dethroned when he was a child and Ming killed his father. Barin wears body armor, a cape and a helmet like a Roman centurion. He promises to rescue Flash in return for Zarkov's allegiance. They head off in Barin's rocketship. Flash, Dale, Aura and Thun emerge onto dry land and see some winged men floating to the ground in the distance; these are some of the best miniatures of the entire series. They are the Hawkmen of King Vultan, an ally of Ming. The Hawkmen have huge wings, even when they aren't flying, and helmets which also have wings on the side; they wear short skirts like a Roman centurion. A fight ensues; Dale and Thun are captured, but Barin's ship lands in time to rescue Flash and Aura. In Vultan's Sky City, which is a Swiftian island in the sky, held aloft by 3 visible beams of light, Thun has been sent to the atom furnace; a guard whips all the prisoners as they shovel radium (!) into the furnaces. King Vultan is a jolly, fat guy with a beard; he also has designs on Dale and torments her with a bear with stripes painted on it. When he learns Barin's ship is approaching, he orders the melting ray be used against it. This looks very much like an ordinary search light. Fortunately, Barin's ship is equipped with resisto-force (always handy in a situation like this) which neutralizes the melting ray, but eventually this resisto-force is depleted, and Barin's ship plummets for the latest cliffhanger. Barin's ship is saved by the gravity-defying rays which support Vultan's Sky City. Aura, Barin, Flash and Zarkov are brought before Vultan who, like Ming before him, allows Zarkov the freedom of his laboratory and sends Flash and Barin to the furnace room. There, a Hawkman regulates the furnace at a ludicrously oversized control, like something out of METROPOLIS (1927). Flash and Barin, stripped to the waist, join the other prisoners. In Vultan's lab, which looks suspiciously like Ming's, Zarkov learns the Sky City is supported by the gravity resisting rays thrown off by the atom furnace. Vultan requests that he find a substitute ray and Zarkov has extra incentive because he knows that long term exposure to the radium in the furnace room will kill Flash and his friends. When a guard whips a prisoner who has collapsed, Flash comes to his rescue, fomenting a mutiny which is overcome. Dale sees Flash being whipped in the Furnace Room and faints again. As punishment for starting the mutiny, Flash is taken to the Static Room where, strapped to an apparatus suspended above a machine giving off sparks, he is nearly electrocuted in this chapter's cliffhanger. Dale faints again to see Flash tortured in the Static Room. Aura threatens Vultan with a ray gun, rescuing Flash, who is brought to Zarkov to revive in the electro stimulator. Dale gets a more demure outfit to wear from Vultan, who tries to win her by performing shadow puppets and giving her jewels, but it's no use. Likewise, Aura declares to Flash that she loves him, but he makes it clear he intends to return to Earth eventually with Dale. Aura threatens him with a blowtorch but is unable to harm him. Flash tries to rescue Dale from Vultan but gets sent to the Furnace Room again, where Zarkov is forced to hook up a high voltage wire to a shackle on Flash's wrist. If he tries to escape again, he'll be electrocuted. Ming arrives and demands the return of his daughter and all the prisoners, but Vultan has his Hawkmen standing by and negotiates from a position of power. During Flash's break from shoveling radium, Zarkov sneaks back and reattaches the shackle to the handle of a shovel. Flash throws the shovel into the furnace which results in this episode's cliffhanging explosion. Escaping from the Furnace Room after the explosion, Flash dashes to the throne room and threatens Ming with a sword but is overcome and taken to the Execution Room. He escapes as the Sky City becomes unstable now that the furnace no longer is operating to produce the rays which kept the city aloft. Zarkov agrees to save the city with a new ray he has discovered provided Vultan frees his friends. Vultan agrees but Ming calls a Tournament of Death. If Flash survives, he wins his liberty, a kingdom of his own and a bride of his choice. Wearing a new outfit, Flash crosses swords with his opponent, the Mighty Masked Swordsman of Mongo. After a prolonged bout, Flash unmasks the swordsman as Barin, who says he was forced into it. Barin apologies to Flash and reveals he is in love with Princess Aura and hoped to win her as the bride of his choice during the tournament. Ming has now decreed Flash must fight "the mighty beast of Mongo" which is an orangopoid (actually a pretty decent gorilla suit with a single horn in the middle of its forehead, like a unicorn). Armed only with a knife, which he soon loses, Flash engages in a losing battle with this creature as this episode's cliffhanger. Aura once again rescues Flash by grabbing a spear from a guard and giving it to Flash who uses it to kill the orangopoid. Highly displeased at the way things have turned out, Ming nevertheless agrees to reward the champion in three days at his Palace. Back in Ming's Palace, Aura spots Flash kissing Dale. With the help of the highpriest, she has Flash and Barin drugged and Flash spirited away. Zarkov finds Barin drugged and Flash missing, with a scarf carelessly left by Aura nearby. Upon interrogating Aura's guard, Barin, Vultan, Zarkov and Dale discover where Aura has taken Flash and set off after him. Flash awakens briefly and is given a second drug by Aura which causes amnesia, as they enter the Tunnel of Terror guarded by the Fire Dragon (the same creature from Chapter 2's cliffhanger), who can be summoned by a gong. Betraying Aura, the highpriest strikes the gong, summoning the dragon as Dale, Barin, Vultan and Zarkov arrive. Zarkov destroys the dragon with a grenade he luckily happens to be carrying. He recognizes Flash has been given a powerful drug, but is unable to counteract the memory loss. At the ceremony to reward Flash for surviving the tournament, Flash is unable to remember anything and refuses to choose a bride. Aura leads Flash away, over Vultan's protest, so Ming has Vultan imprisoned. Misled by Aura, Flash repudiates his friends, forcing Barin to knock him out in order to get him to Zarkov's lab. Belatedly, Zarkov has discovered a ray which restores Flash's memory. Ming's guards break into Zarkov's lab and just as they are about to execute Flash, he disappears in this chapter's cliffhanger. Zarkov has made Flash invisible via yet another ray he has discovered combined with his newly invented invisibility machine. Flash uses his new invisibility to choke Ming in his own throne room, but spares his life at the request of Prince Barin. He then frees Vultan from his cell. Aura spies on the lab and discovers the plans of Flash and his friends. Vultan, Zarkov and the invisible Flash carry power magazines to Zarkov's rocketship, while Dale and Barin guard the invisibility machine. Barin notices Aura's listening device and takes Dale to a cave in the catacombs under the palace for her safety. Aura sets out to find Dale using the sacred Tigron (a tiger on a leash). Flash spontaneously becomes visible during a struggle with Ming's guards, as Barin returns. Flash and Barin set off to retrieve Dale, as the Tigron attacks her in this chapter's cliffhanger. Flash strangles the Tigron, rescuing Dale, who is none the worse for her recent mauling. Barin convinces Aura to win Flash's friendship by helping him (Aura had earlier used this argument on Vultan about Dale). Aura brings Flash, Dale and Barin to the throne room, where Barin declares his love for Aura. With Aura's intercession, Ming grants everyone's freedom, but it's just another ploy and he sets spies on Flash and his friends. Although he's eager to be rid of Flash, Ming still lusts after Dale and wants to retain that scientific genius, Dr. Zarkov to help him conquer the universe. Zarkov contacts Thun on the spaceograph and asks him to meet at Vultan's Palace. Barin arranges to meet Flash at the turret house, but is overhead by Ming's spies. Ming captures Barin and uses his ship to fire on Flash and his friends, trapping them in the turret house in a fiery explosion which is this chapter's cliffhanger. In this serial's one cliffhanger cheat, Flash finds a trap door through which everyone escapes before the turret house is destroyed in an explosion. As they make their way through yet another underground tunnel, they see Barin being led to prison and rescue him. They return to Zarkov's lab where he has electrified the door to prevent Ming's guards attacking them, but Ming has the power turned off. Just as his guards are about to nab Flash and his friends, Thun leads an air attack in his gyroships and the Lionmen break into the throne room. In the general melee, Ming escapes into the Sacred Palace of the Great God Tao "from which there is no return" according to the hardly reliable highpriest, who announces Ming's death to Flash and Aura, who nevertheless believe him. Aura now rules Mongo with Barin as her consort. Barin, Aura, Thun and Vultan see off their Earth friends as they board their rocketship for the return trip to Earth. Once airborne, however, the highpriest can't resist gloating to Aura that they are doomed because he has planted a bomb on Zarkov's rocketship. Barin quickly heads to the lab to contact Flash via Zarkov's communications device. Flash finds the bomb and, with little impact from the lack of air or the absence of gravity in space, opens the door of the rocketship and chucks it out seconds before it explodes. En route to Earth, Flash communicates with his father, requesting that all power on Earth be turned off (!) in case it "counteracts" the rocketship. There is a brief montage of stock footage of newspaper headlines, excited crowds and the charming old New York skyline but Flash and Dale are oblivious, having eyes only for each other. Versions of this serial were re-edited and re-released as a feature film variously titled ROCKET SHIP, SPACESHIP TO THE UNKNOWN and SPACE SOLDIERS.